So yeah, yeah I know American Apparel and Dov Charney are currently under a lot of heat but look I have always been a fan of their basics. Last year they launched a nail color collection which I became rather obbsessed with…Among my favorites shade were DTLA, Mouse and Poppy…as the list could go on…Now, I want their latest collection, and a.s.a.p. 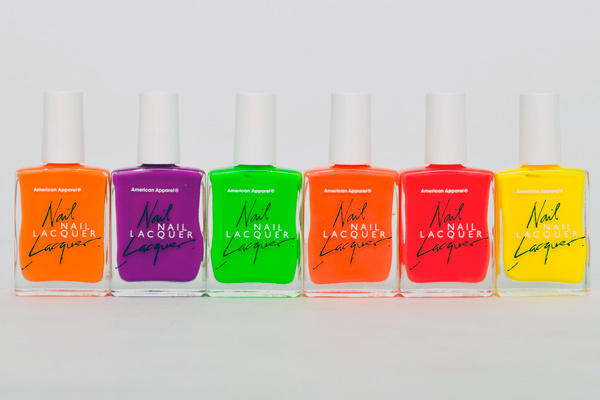 The company is releasing 6 limited-edition neon colors in their thick “one coat of polish is enough” formula. Mmmm neon red and neon yellow need to get into my hands and onto my nails…like, now. Each shade will only come in 2,000 bottles so get on it! This entry was posted in Fashion and tagged American Apparel, Nail polish. Bookmark the permalink. One Response to American Apparel: Ne[ON IT]! I enjoy what you guys are usually up too. Such clever work and reporting! Keep up the awesome works guys I’ve included you guys to our blogroll.